A disulfide bond, also called SS-bond or disulfide bridge, is a single covalent bond formed from the oxidation of sulfhydryl groups. Disulfide bonds play an important role in understanding protein folding, evolution, and structural properties. 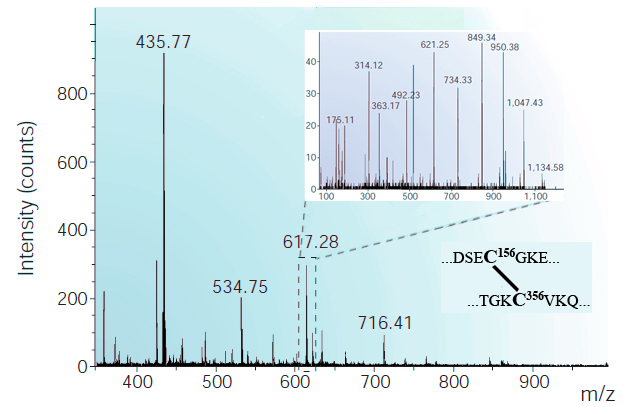 Mass Spectrometry is a powerful analytical technique used for identification of unknown compounds, quantification of known compounds, and to elucidate the structure and chemical properties of molecules. It has become the standard high throughput method for protein identification, and more recently, for protein quantification. Determining the disulfide bonding pattern in a protein is one of the critical stepping stones towards obtaining a mechanistic understanding of its structure and function. Consequently, this problem is a crucial one in contemporary proteomics and structural bioinformatics. MS2DB+ is an open-source platform-independent web application that efficiently determines the disulfide linkages in proteins based on tandem mass spectrometry data. The software can account for multiple ions (a, ao, a*, b, bo, b*, c, x, y, yo, y*, and z) in determining the disulfide bonds, yet ensuring that the solution is found in polynomial time. The application uses a local-to-global approach to merge putative disulfide bonds found by the search-and-match framework into the most likely global disulfide connectivity pattern. This optimization technique ensures the connectivity topology determined is consistent. The disulfide connectivity pattern identified is presented in both graphical and tabular user-friendly formats. In its default mode, MS2DB+ is completely automatic and easy-to-use. At the same time, expert users are provided with an opportunity to “tune” crucial parameters required in the disulfide bond determination process. If you are not familiar with MS2DB+, check the demo video below to get started (best video quality: 720p HD and full screen) or click here to download/access the video directly. The most up-to-date source code is available here.